Spare yourself the stress of battling over the brush. 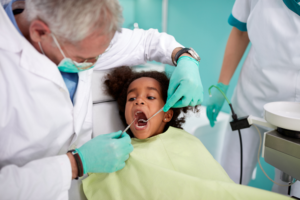 Parents of toddlers are no stranger to the twice-a-day struggle of getting their kids’ teeth brushed. The combination of a stressed parent and a strong-willed kid usually make for a morning and bedtime routine that takes way too much time and effort. However, she came up with a simple parenting hack that can help distract toddlers while parents get those pesky teeth clean. And all it requires is an extra brush. “I have since figured out a two toothbrush solution, where I give him one toothbrush to chew on and hold, while I do the real brushing with a second toothbrush,” she explained. The first brush acts as a decoy for the kid to play with and the second actually gets the job done. A classic bait and switch. As one commenter pointed out, this helps give the child a sense of independence. Others mentioned that the old switcharoo works in plenty of situations. This article was written by Nicole Sheinzok from Working Mother and was legally licensed through the NewsCred publisher network. Please direct all licensing questions to legal@newscred.com.